A wide expanse of sandy beach, gentle waves rolling in, a beautiful warm day and your canine companion by your side, it doesn’t get any better than that. A romp on the beach, running in the sand and splashing in the water is heaven to most dogs and enjoyable for their owners as well. Before you set out for the beach, check the local ordinances for dog accessibility to beaches in your area. There are some beaches that post “No Dogs Allowed” signs that prohibit dogs from the beach at any time of day and any time of year. Others allow dogs during specific hours, generally before 9:00am and after 6:00pm or any time from October to May when there are fewer beachgoers on the sand and in the water. A recent trend indicates many beach ordinances are becoming increasingly pet friendly and dogs are allowed on the beach at any time if they are leashed and controlled. 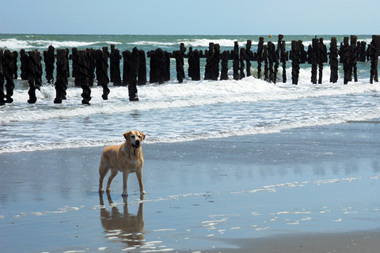 Still other beaches are designated “Dog Beaches” where dogs can be off leash and roaming free. These beaches are specifically for dogs and their owners. 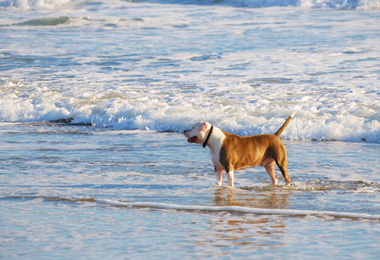 Practicing good pet etiquette beach rules ensures that the beach is enjoyable for both canines and people. Pet owners are responsible for the behavior of their pets. Follow the rules for the specific beach you visit to prevent complaints, citations and penalty fees. Dog waste left on the sand or where it can be washed into the water by changing tides can present a health threat. The bacteria in dog waste can cause illness in ocean life, children playing in the sand and people walking on the beach. Always, without exception, clean up after your dog. Many New England beaches have restricted areas for nesting endangered birds. These areas are roped off and easily avoided by humans, however, curious dogs are able to enter them easily. Dogs are attracted to birds and often enjoy chasing them. A dog stepping into a nesting area or chasing an adult bird off a nest can do irreparable harm and cost a dog owner a hefty fee. Control or leash your dog near nesting areas. One other good etiquette practice is to keep your dog from jumping on people. You know your dog is friendly, just wants to play and would never hurt anyone, but a stranger, particularly a child, can be frightened by a dog racing at them and jumping up. Control your dog with voice commands. As pleasant as the beach is, it is important to keep in mind that there are safety and health concerns for dogs at the beach. Your dog may be very well mannered and well trained but not all dogs are. Some are very aggressive and uncontrolled by their owners. Altercations between dogs occur and bites are often the result. Keep your dog within shouting distance and be assertive about commands to “come”. Even on the cleanest beaches, the waves leave an array of washed up objects on the beach with each tide cycle. Dead fish and birds, rubbish, broken shells, glass, rotted food, plastic, fishhooks, driftwood, sharp rocks and seaweed are all intriguing to dogs who may try to ingest them and suffer intestinal blockages or incur cuts and lacerations from stepping on them. Particularly dangerous to dogs is the ingestion of dried seaweed which absorbs moisture in the intestinal tract causing it to swell and create a painful and serious blockage. This type of blockage can be fatal. Keep dog snacks with you to lure your dog away from tempting but inappropriate things to eat. 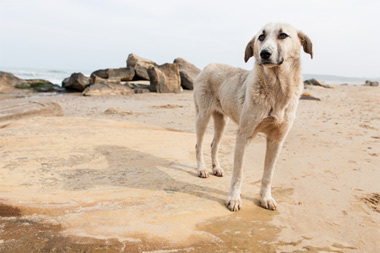 Dogs should also be kept away from tide pools due to slippery wet rocks, sharp barnacles, pinching crabs and the likely destruction of small sea creatures by stepping on them. Another hazard is driftwood, sometimes picked up by pet owners as a stick to play fetch with. Drift wood is very soft on the outside, brittle on the inside, splinters easily and can cut mouth parts or be ingested. Always carry a first aid kit. Some beaches have areas with tall grasses growing. These grassy areas are a perfect habitat for deer and field mice and are rife with ticks. These areas should be avoided to prevent Lyme disease. Dogs can suffer from sunburn. Use sunblock products specifically formulated for dogs and apply it to the ears, nose or any other place where fur is sparse. Be sure the sunblock is Zinc free as Zinc is toxic to dogs. Provide shade for your dog, under a tree, a table or a beach umbrella. Give it a beach towel to lie on rather than the hot sand. Dogs overheat easily. Be careful of hot sand or asphalt that can burn the bottom of your dog’s paws. It is best to walk and play below the high tide mark where the sand is cooler. Provide an abundant supply of clean, fresh drinking water. A thirsty dog will drink seawater. Large amounts of ingested seawater can cause rapid dehydration and salt poisoning. Despite popular belief, all dogs cannot swim. Your dog will let you know if it can swim or not or if it even likes the water. Never force a dog into the water if it balks. If your dog is a swimmer but is new to ocean swimming, provide it with a life jacket designed for dogs and introduce it to waves on a calm day. It takes time to get used to the movement of the ocean currents. Be aware of changing ocean conditions and the possibility of riptides. Check for the presence of jellyfish. A jellyfish sting can be a serious health concern for dogs. If your dog swims a distance from shore, watch for boats and jet skis which sometimes have difficulty seeing a dog in the water. If possible, rinse the sand and saltwater off the dog before returning home. At the very least wipe it down with an old towel to remove most of the sand and water. Dried saltwater on fur creates itching. Be sure your dog is wearing updated easily visible ID information. 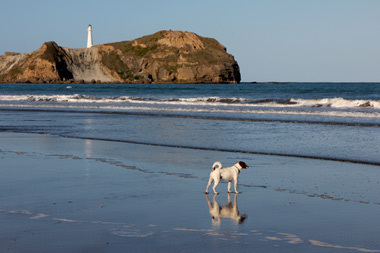 Even the most obedient dog can wander off and lose its way when it becomes excited by all the tempting sounds, scents and natural wildlife of a beach environment. Now that we’ve discussed the rules, the hazards, and all the negatives, the only thing left, and the most important thing, is to enjoy the beach and the time with your pet. Find an unpopulated or sparsely populated section of beach and let you dog run. Bring a ball or Frisbee and play together. Enjoy the sun, the sand, the sea and the company of your four legged companion.